Drizzling this molten cheese with orange blossom honey gives the finished dish wonderful layers of flavour. A perfect partner to ripe festive fruits. Remove the cheeses from their boxes and peel away the wrappers. Remove the stickers from the boxes and place the lids under their bases for support. Return the cheeses to their boxes. Score the top of each cheese in a criss-cross pattern with a sharp knife and use the tip to push the thyme into the cheese. Preheat the oven to 190°C, gas mark 5. Place the cheeses, in their boxes, on a baking sheet and bake for 20 minutes or until wobbly in the centre. Meanwhile, spread the walnuts out on a baking tray and add to the oven with the cheese for the final 5 minutes of cooking. Quarter the pears, remove the cores and cut them and the figs into wedges. 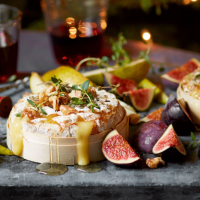 Scatter the tops of the cheeses with the toasted walnuts, some more thyme leaves and a drizzle of honey. Serve with the pears and figs to dip. Simply return the cheese to the oven if it starts to become solid again. Prepare to the end of step 1, cover and keep in the fridge for up to 24 hours then continue from step 2.